The next big change I noticed is the all-new Robotics functions palette. I’ve always felt that LabVIEW has been a good programming language for robot development, and now it just got better, with several new robotics-specific programming functions, from Velodyne LIDAR sensor drivers to A* path planning algorithms. There looks to be hundreds of new VIs that were created for this product release. This is just my taste of the new features this product has. 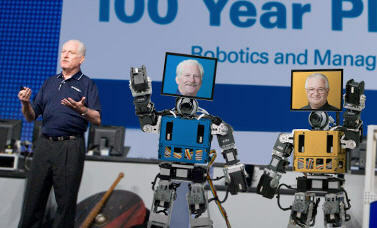 To get the official product specs and features list, you’ll have to visit the LabVIEW Robotics product page on ni.com. I also found this webcast, Introduction to NI LabVIEW Robotics, if you care to watch a 9 minute demo. A more critical product review will be coming soon. Looks like the robot revolution has begun. Blog Spotlight: Dr. Ben Black, a Systems Engineer at National Instruments, is documenting his trials and tribulations in his blog as he builds an autonomous unmanned aerial vehicle (UAV), using a SingleBoardRIO (2M gate FPGA+400MHz PowerPC processor), four brushless motors, some serious controls theory and lots of gorilla glue. I particularly appreciate his attention to the details, stepping through elements of UAV design that are often taken for granted, like choosing reference frames, when you should use PID control, and the genius that is xkcd. I think that the true interdisciplinary nature of the problems really makes the field interesting. A roboticist has to have at minimum a working knowledge of mechanical engineering, electrical engineering, computer science / engineering and controls engineering. My background is from the world of mechanical engineering (with a little dabbling in bio-mechanics), but I end up building circuits and writing tons of code. I’ve had to pick up / stumble through the electrical and computer science knowledge as I go along, and I know just enough to make me dangerous (I probably don’t always practice safe electrons…sometimes I let the magic smoke out of the circuits…and I definitely couldn’t write a bubble sort algorithm to save my life). My point in this soap-box rant is that in the world of robotics it’s good to have a specialty, but to really put together a working system you also need to be a bit of a generalist. For anyone even considering building a UAV (or just likes to read about cool robotics projects), I suggest you check it out. He shares his .m-files, LabVIEW code, and more. Thanks Ben. How 9 mechanical engineering undergrads utilized commercial off-the-shelf technology (COTS) and design HW and SW donated from National Instruments to create a sophisticated, semi-autonomous vehicle that allows the visually impaired to perform a task that was previously thought impossible: driving a car. Greg Jannaman (pictured in passenger seat), ME senior and team lead for the Blind Driver Challenge project at VT, was kind enough to offer some technical details on how they made this happen. One of the keys to success was leveraging COTS technology, when at all possible. This meant, rather than building things from scratch, the team purchased hardware from commercial vendors that would allow them to focus on the important stuff, like how to translate visual information to a blind driver. So they started with a dune buggy. They tacked on a Hokuyo laser range finder (LIDAR) to the front, which essentially pulses out a laser signal across an area in front of the vehicle and receives information regarding obstacles from the laser signals that are bounced back. LIDAR is a lot like radar, only it uses light instead of radio waves. For control of the vehicle, they used a CompactRIO embedded processing platform. They interfaced their sensors and vehicle actuators directly to an onboard FPGA and performed the environmental perception on the real-time 400 Mhz Power PC processor. Processing the feedback from sensors in real-time allowed the team to send immediate feedback to the driver. But the team did not have to learn how to program the FPGA in VHDL nor did they have to program the embedded processor with machine level code. Rather, they performed all programming on one software development platform; LabVIEW. This enabled 9 ME’s to become embedded programmers on the spot. But how do you send visual feedback to someone who does not see? You use their other senses. Mainly, the sense of touch and the sense of hearing. The driver wears a vest that contains vibrating motors, much like the motors you would find in your PS2 controller (this is called haptic feedback, for anyone interested). The CompactRIO makes the vest vibrate to notify the driver of obstacle proximity and to regulate speed, just like a car racing video game. The driver also wears a set of head phones. By sending a series of clicks to the left and right ear phones, the driver uses the audible feedback to navigate around the detected obstacles. The team has already hosted numerous blind drivers to test the vehicle. The test runs have been so successful, they’re having ask drivers to refrain from performing donuts in the parking lot. And they already have some incredible plans on how to improve the vehicle even further. Watch the video to find out more about the project and learn about their plans to further incorporate haptic feedback.